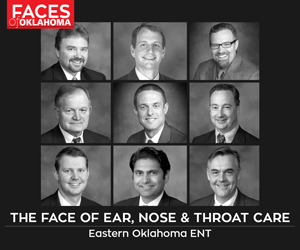 OSU, OU and TU have their share of enthusiasts who take cheering for their favorite teams a notch above the rest. John Griffith wears something showing his support of OU every day, but goes to extremes on game days. We’ve all seen him: the bare chested guy in outlandish boxer shorts, painted from the waist up, chanting the team mantra, holding up a sign and encouraging other fans to cheer. He’s the one fan you think could almost pass as the team mascot. Sports teams in Oklahoma, especially on the collegiate level, have legions of superfans, who are something more than your average sports enthusiast. They live up to the word fanatic and some are legendary. Enthusiasm devotee Lee Redick is one of those legends. You are sure to find him and his florescent orange jumpsuit at every home game of the Oklahoma State University Cowboys. Many know him as Mr. Orange Power (or Mr. OP or just OP). 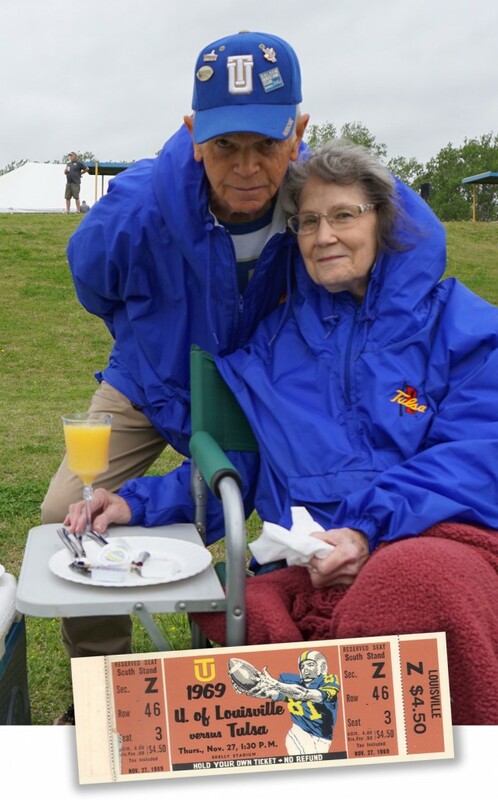 He and his wife, often referred to as Mrs. OP, have attended every home game since 1997, but it wasn’t until 1999 when he started living up to his name. Redick says his orange power persona started by accident. It wasn’t until the Big 12 basketball tournament in Kansas City, Missouri, that Redick’s wife stopped him and suggested he get other fans to participate with him. Lee Redick found his trademark orange jumpsuit in the basement of a newly purchased home in Tulsa. Not long after that game, the Redicks bought a house in Tulsa. It just so happened that in the basement of the new home was a florescent orange jumpsuit that fit Redick like a glove. It soon became the apparel that he is well known for wearing. It is also what helped him gain traction in becoming Mr. Orange Power. 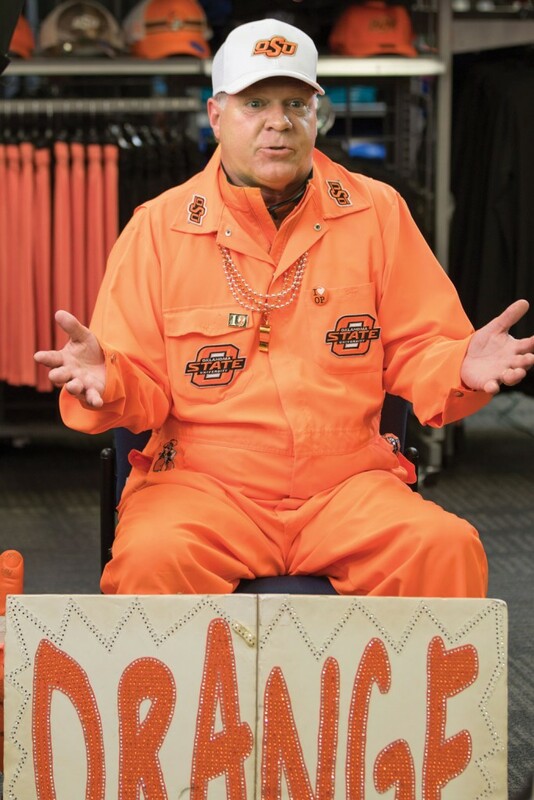 “I took the jumpsuit into Bedlam Sports and asked them to put ‘ORANGE POWER’ on the back and a bunch of OSU patches all over,” he says. “I wanted to look like Elvis meets NASCAR! However, Redick doesn’t see himself as a superfan. He says his main goal is to have a good time and help the Cowboys win. The University of Oklahoma is not without its superfans. Like Redick, John Griffith is definitely a step above many spectators. 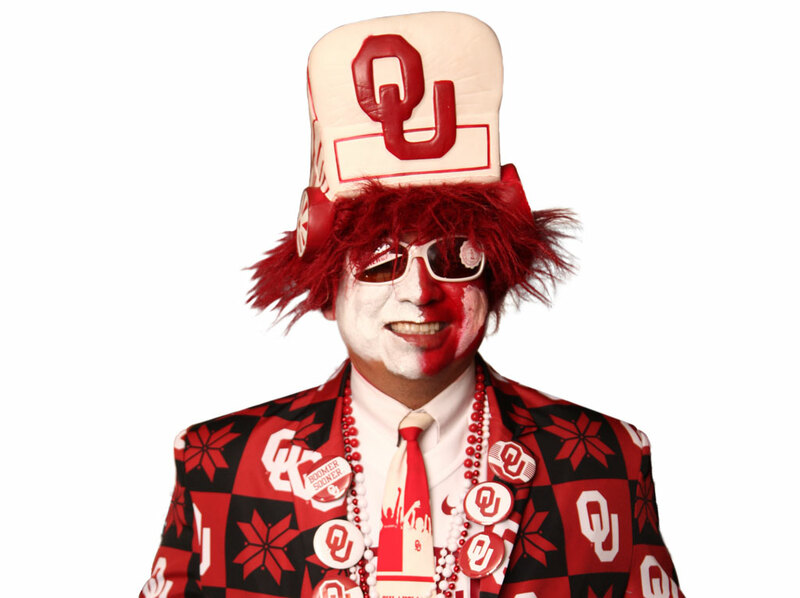 He even has a cardboard cutout of himself decked out as his superfan persona, The Sooner Guy. Griffith embodies the OU spirit from head to toe. 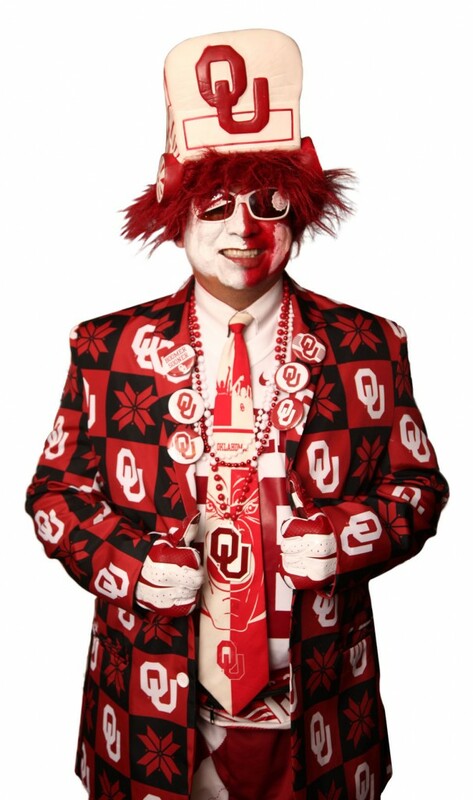 At home games (and some away games), you can spot him in his OU boots, sunglasses, socks, boxers, suspenders, shirt, tie and over-the-top hat. You can guarantee that his face will be painted crimson and cream. Dedicated enough to drive from Tulsa to Norman for OU home games, Griffith has attended contests since he was in third grade. His transition from fan to superfan has been gradual and has only taken root in recent years. After his dad died in 2008, Griffith took a hiatus from attending games. It wasn’t until 2015, when he decided to go to a Tennessee vs. OU game with his brother, that he stepped up his game. “I decided I wasn’t just going to go to the game; I was going to go big,” Griffith says. “I had some black shorts and a white OU T-shirt, and I put on some white Halloween makeup and that was it. Not all superfans wear paint or a cape. Some are like Ted Williams and dutifully attend home, away and bowl games. Williams graduated from the University of Tulsa in 1964 and attended a few games, but it wasn’t until his children were old enough to go to games that he started buying season tickets. It’s been a family affair ever since. “We try to make all the home games and are usually joined by an assortment of children, grandchildren and great-grandchildren,” he says. Dedication is what makes a superfan and, according to Williams, all of TU’s regular fans are superfans. Williams has traveled to bowl games all over the nation, including Dallas; Boise, Idaho; Memphis, Tennessee; Mobile, Alabama; and Anaheim, California. He doesn’t think everyone has to be a superfan to support a team, but he would like more people to cheer on TU sports teams. Next articleU Drive. U Text. U Pay.